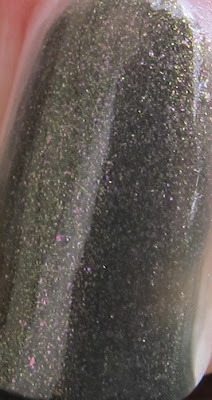 Today's post features a gorgeous polish that has been sitting in my untrieds pile and I can't imagine why!!! This beautiful olive green with pink/gold shimmer is Rescue Beauty Lounge Anne. Anne is another Bring It Back Limited Edition shade. I'm trying to swatch all of my LE RBLs before they sell out. I hate to show you a stunning polish and then tell you it's no longer available! The pink/gold shimmer in Anne shows up in bright sunlight or bright lights, but unfortunately it wasn't very sunny the day I took these pictures. You can see some of the pink and maybe a hint of gold on the left side in the macro shot below. This is two coats and the formula was lovely. Nice and smooth! I can't wait to wear this in the fall. It seems a bit out of season at the moment, but I will definitely wear it a lot come September. Rescue Beauty Lounge Anne is available now at rescuebeauty.com. It is limited edition though, so if you really want it, order it soon. Anne is one of my fav's ♥. I agree Ashesela!! I can't wait to wear it in the fall! I love it too now Victoria! I don't know why I let it sit untried for so long. Deborah- it's a new favorite for me, definitely. What other RBLs do you love?? Thanks TikiBarbie! I am loving this color. I really like olive green, but the shimmer makes it amazing.